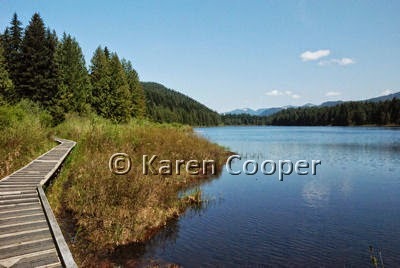 Rolley Lake Provincial Park is a gem of a find outisde of Mission, British Columbia, Canada. About a 45 minute drive from Vancouver proper, it is well worth the drive to experience some clean air and blue skies. There is a picnic area, small beach, camping and even fishing on this lake. No power boats are allowed here, so it's peaceful atmosphere can totally captivate you. There is a trail aroud the whole lake that is easily accesible for any fitness level. There is also a small waterfall on the east end of the lake that is well worth the few mintue hike through the forest to see. This would be a great place to spend the day in the heat of the summer, or pitch a tent for some much needed get-away time from city life. I spent a few very enjoyable hours here walking the perimeter of the lake and generally doing some de-stressing and nature-bonding. Lots of critters about in the glorious almost-summer weather. Thanks for dropping by and reviewing my blog. It's so nice to hear from other bloggers. I found your blog while looking for directions up to Rolley as I am camping there next week for some "get-away time". I've also enjoyed reading about Colony Farm. I pass it every day and really should stop for a walk.